Union minister Abbas Naqvi said that some sick people were allegedly trying to disturb the communal harmony in society. 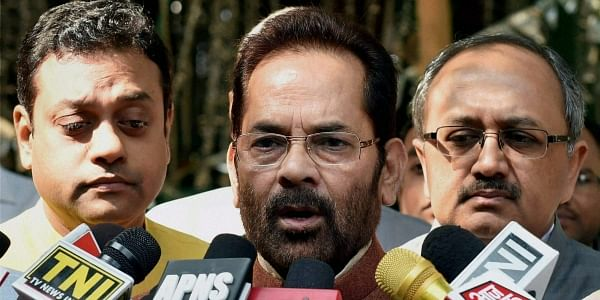 NEW DELHI: Union minister Mukhtar Abbas Naqvi today sought to see the burning to death of a Muslim labourer in Rajasthan earlier this week as a "criminal incident" and not as a case of "love jihad" as was being alleged. The minority affairs minister also, without naming anyone, said that some "sick" people were allegedly trying to disturb the communal harmony in society. He said a crime should not be clubbed with religion. Naqvi, however, stressed people allegedly doing so will not succeed in their "nefarious designs". Naqvi, who chaired a meeting of the general body of Maulana Azad Education Foundation here, also said that short- term certificate courses of 'GST facilitator' and 'sanitary supervisor' have been providing employment opportunities to a "large number" of youth from minority communities. "It is an unfortunate incident. We should not club crime with religion and treat criminal incidents as criminal incidents only. The state government has already taken strict action against the guilty," Naqvi said, when asked about the alleged "love jihad" incident. He added, "Some sick people are trying to disturb the communal harmony in society. But they will not succeed in their nefarious designs." A 48-year-old Muslim labourer, from West Bengal, was hacked and burnt to death in Rajasthan's Rajsamand earlier this week, leading the police to arrest the killer, seen raving against "love jihad" while torching Mohammad Afrazul in videos of the incident shared on social media. The accused, identified as Shambu Lal Raigar, is seen in the videos ranting against "love jihad", a term used by sections of Hindu activists to describe marriages between Hindu women and Muslim men, who they claim seek to propagate Islam. Meanwhile, the meeting reviewed various schemes being run by the foundation for educational and skill development of minorities. The minister said the youth benefited by the 'GST facilitator' course, are helping small, medium enterprises and also big business groups. "Similarly, sanitary supervisors are getting jobs in different projects across the country. Lakhs of toilets, cleanliness centres, health centres are being constructed under the Clean India campaign and these supervisors are strengthening it," he added. Reiterating Modi government's commitment towards educational empowerment of minorities, Naqvi said his ministry was spending more than 65 per cent of its total budget on the activities related to the sector. He said more than 1.5 crore students have been given various scholarships by the ministry in the past three years. The minister also talked about the efforts being made under the government's multi-sectoral development programme and the plan to set up 100 skill development centres named as 'Garib Nawaz'. "I myself have been monitoring all the educational empowerment and skill development programmes. Any negligence in implementation of these schemes will not be tolerated," he added.